Over the past few weeks, the George Zimmerman trial has been in the news. If you’re unfamiliar with it, I recommend checking out the extensive Wikipedia page on the case. To provide a brief summary, George Zimmerman is accused of murdering Trayvon Martin, a 17 year old African American boy in a housing community in Sanford, Florida. The details of exactly what happened the night of the shooting are quite unclear. What does seem clear is that Zimmerman, a volunteer with the local neighborhood watch, saw Martin walking through his community and called 911 to report Martin as a suspicious character. He followed Martin. A fight broke out between the two. The details of who started the fight are a major point of contention in the case. Zimmerman claims Martin attacked him when he got out of his car. Witnesses such as Rachel Jeantel have claimed that Zimmerman approached Martin in an aggressive manner. The fight ended when Zimmerman shot Martin in the chest, killing him, an act he claims was self-defense. The case has been quite controversial as many have claimed that Zimmerman followed Martin that night because he was a young African American man wearing a hoodie (that is Zimmerman racially or otherwise profiled Martin). Also complicating matters is the fact that Zimmerman claims that, in shooting Martin, he acted in self-defense. Florida law permits the use of deadly force when a person feels he or she is under threat of death or great bodily harm. Unfortunately resolving the question of whether Zimmerman was under such a threat is incredibly difficult, because the only living witness who had a good view of the fight is George Zimmerman. As a result, the prosecution relied heavily on a witness, who could not see but instead could hear aspects of the altercation as it unfolded. 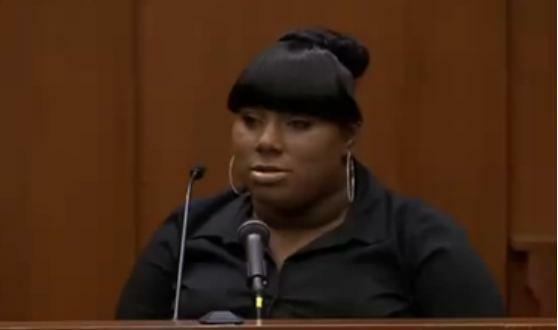 Her name is Rachel Jeantel, a good friend of Trayvon Martin. She was on the phone with Martin as he walked home that night. Her testimony was considered to be the strongest piece of evidence against George Zimmerman. I’ve been asked recently what I thought about the case and particularly about Jeantel’s use of language, so I thought I’d take this opportunity to tackle a few of the more common and outrageous ideas about her language, especially since they are relevant to more general ideas about African American English. Comments like the one above suggesting that Jeantel (“RJ”) cannot speak English have been quite common. They are, of course, completely wrong. Jeantel speaks a highly prevalent variety of English known as African American (Vernacular) English in addition to Haitian Creole and Spanish (some have suggested that her linguistic difficulties stem from Haitian Creole being her primary language, but as others have noted Jeantel is a fully competent speaker of African American English, having grown up speaking it). African American English is a variety of English spoken commonly among African Americans (to be clear, it has no essential connection to skin color and not all African Americans speak African American English nor is it impossible that a White, Hispanic, or Asian American could learn to speak it, although there are a number of reasons why this would be unlikely to happen). African American English is a perfectly useful language for communication among those who speak it, much like middle class European American English (often arbitrarily dubbed ‘standard’ English) is a perfectly useful language for communication among those who speak it. As has been detailed in countless resources (see, for example, this, this, this, this, this, this, this, or this), African American English (like any other language) is governed by grammatical rules (that is, it is not random) and is capable of conveying complex thoughts and ideas. Of course, as a practical matter, Jeantel also obviously understands so-called ‘standard’ English, even if she does not speak it. We can observe this from the fact that she understands the English spoken by the attorneys who questioned her during the trial asking her complex questions about details of an event that was highly traumatic for her. Even if communication was at times problematic, Jeantel demonstrated the ability to use her own English (that is African American English) and to understand the English spoken by others (for example, that spoken by the attorneys). Related to the idea that Jeantel cannot speak English is the idea that she couldn’t be understood by a wide (or more appropriately, White) audience. There are two points to be made here. First, in many cases, such as the comment above, there does not appear to be an issue of genuine communication difficulty. Language features like the African American English pronunciation of “asked” as “aksed” is unlikely to cause communication difficulty, despite the commenter’s claim that he is translating so “everyone understands”. Some of the other examples such as “bout”, “yeah”, and “naw” are rather ubiquitous features of language even among so-called ‘standard’ English speakers. The suggestion then that Jeantel’s language is incomprehensible because of these features is far-fetched at best and is more likely an example of language elitism. It would not be surprising that communication difficulties arose between people who speak different varieties of the same language. Indeed, many people in the United States find it difficult to understand, for example, British English, especially when varieties of British English other than that used on the BBC are being used (note the prevalence of subtitles on British movies like the James Bond series). The issue here then is simple lack of familiarity, and it’s innocent enough. What is, however, unfair is that commentators have placed a heavier burden on Jeantel to make herself understood than on, for example, the defense attorney Don West. Because Don West’s English is considered ‘standard’, communication difficulties that arose between him and Rachel Jeantel were assumed to be the fault of Jeantel. However, we could just as reasonably claim that West’s (and others’) lack of familiarity with African American English is to blame for these difficulties. A particularly embarassing moment for Jeantel in this trial has been the discovery that Jeantel struggles with reading and writing English. This fact was revealed during questioning by Don West where he showed Jeantel a copy of a letter a friend had written at Jeantel’s request. The letter (click here to see it), written in cursive script, contained an account of her conversation with Martin and was addressed to Martin’s mother. Jeantel, clearly embarrassed, admitted that she could not read the letter in its entirety. This moment led to many commentators gleefully shaming Jeantel (calling her, for example, “illiterate”) as in the above screenshot of a YouTube video. However, there are a few important things to keep in mind here. 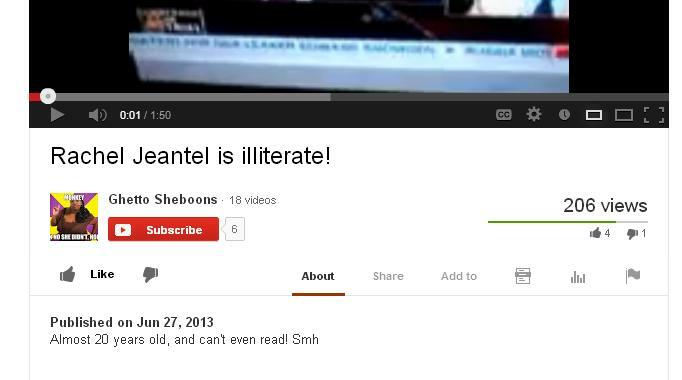 First, to say that Jeantel is illiterate is an insulting exaggeration. 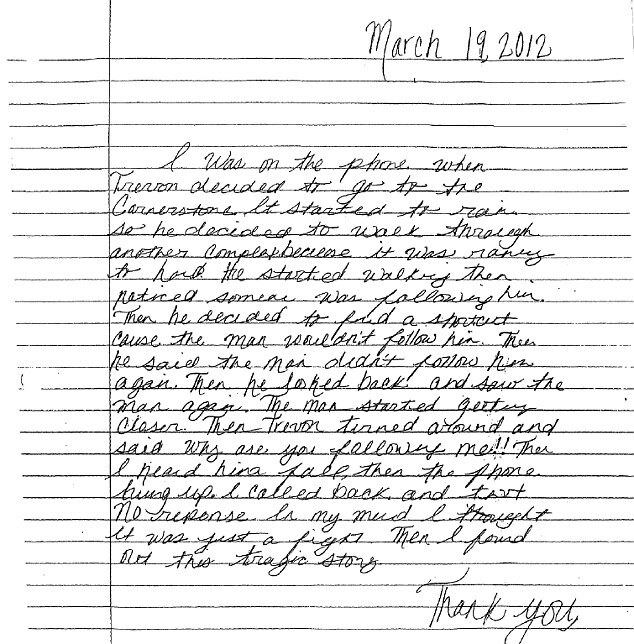 Jeantel was shown at least one piece of evidence (a record of the calls between her and Martin) that required her to decipher written language during her testimony. Second, we know from the testimony that Jeantel frequently texted with Martin and others. Finally, Jeantel’s Twitter account reveals that she is capable of reading and writing. Second, the letter was written in cursive script. Due to the contemporary ubiquity of computers and other forms of digital writing, cursive handwriting has been gradually disappearing from public school curricula for quite a few years now. Jeantel’s inability to decipher cursive script, though perhaps a little embarrassing in the moment (since it showcased her apparent difficulties with literacy), is far from unusual for someone her age. Finally, we do have evidence that Jeantel struggles with writing especially when we consider that she is a high school senior. In other words, she is clearly not reading and writing at grade level. The fact that she asked a friend to write a letter for her is a fairly clear indication that such a task is not easy for her (and her embarrassment on the stand suggests that this is a broader source of shame as opposed to a simple desire not to have to write down painful memories). We would need to know more about the specifics of her educational history to understand exactly how Jeantel has progressed through the education system despite these difficulties. However, if we take a broad view of the situation, it is unfortunately very common for students of urban public schools (particularly those attended by African Americans or Hispanic Americans). A sizable reading achievement gap exists between White (particularly upper and middle class) and African American students in K-12 education. In looking at the public response to Jeantel’s language it’s clear that the response it garnered is an example of how speakers of ‘nonstandard’ English face extreme disadvantage in society. Here we see the credibility of a witness questioned on the basis of her language (a phenomenon I mentioned in a previous post). Even more than that though we see a young woman, who was simply performing a public duty (participating as a witness in a criminal trial), publicly shamed and insulted not only for her difficulties with literacy but also for using a perfectly legitimate language: African American English. Regardless of one’s opinion on whether Zimmerman’s motives were racially based, it’s clear that race has played a major and ugly role in the public response to this trial. Watching the examination of Jeantel by Zimmerman’s attorney could be used in a Socioling or Pragmatics course to show miscommunication based on features of language that most people are completely unaware of or attribute to one of the people being “wrong,” “stupid,” “illiterate,” etc… Attorney’s are trained to make people confused, feel belittled, trip over their words, etc. so it is completely reasonable that a teenage girl who has very little to no knowledge of the cultural context of a courtroom would respond the way that she does. His monotonous reading of the times of the text messages / phone calls (the first time Jeantel starts to say she’s confused or lost) had me lost and frustrated too – which was the lawyers intention – to get her rattled and bring out her “bad attitude”. It would have made any witness agitated – particularly a teenager who has no understanding that he is doing it intentionally. Thanks for your thoughtful post on this.